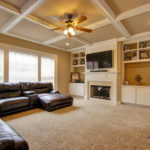 Winter is the perfect time for North Atlanta interior home remodels, as we mentioned in a previous blog. Contractors have less work, more materials are available, and they have easier access to permits. 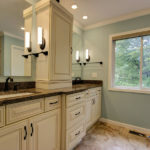 And with winter being a great time for remodeling, one of the best places to begin when looking for an interior remodel project is the bathroom! Bathrooms have proved to be one of the smartest re-design areas in your home for return on investment. Additionally, they are an area of your home that can maximize relaxation and add happiness. With that in mind, here are the top suggestions for creating your future bathroom. Master bathro oms are now larger with bigger vanities and more open space. The measurements for your new shower have to be perfect, especially if you’re making a glass enclosure for the shower as, quite often, this is the first thing you notice. Incorrect or highly customized measurements can be very costly and later, can cause other issues down the road. Adequate ventilation is also key or you might risk mold growing on your ceiling or into the rest of your bathroom. Perhaps you can use beautiful glass tile or three-quarter inch mosaic tiles as accent tile with a much larger main tile for the rest of the shower to break the monotony of a single color uniform size tile scheme. Bathroom graded recessed lighting with a dimmer switch will allow a personalized feel. In-wall shelving is beautiful and useful, and is mounted between the studs of the wall to give you an out-of-the-way spot to keep your personal products. Universal design (UD) is an important and top-of-mind concept that is specifically useful in bathroom remodels. Safety, mobility, and accessibility are features that enhance a bathroom remodel not only for the physically challenged or older individuals in the home, but also for the very young. Remodeling with these UD ideas will provide a space that is convenient, safe and adaptable for any lifestyle change. And many other features that will provide a bathroom that can grow with your needs. Stepping onto cold tile in the winter months or after a warm shower can be an unpleasant experience. Not only considered a wonderful feature but an excellent investment strategy, you may want to consider in-floor radiant heating. • Hydronic heating which uses heated water that’s distributed through a tubing system. It is important to speak with a professional contractor if you’re considering either of these two systems. While electric radiant heat is an easier install than the hydronic system, there are pros and cons with regard to size of area being heated, initial cost, and cost efficiency over time that you should be made aware about. At Quality Craftsmen, we help you make the process as easy as possible. We can design everything, so you don’t have to hire someone else or do it yourself. 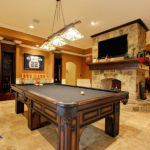 Also, we can work with you to help you create the perfect budget that will meet all your remodeling goals. To see some ideas that might inspire you for your future new bathroom, check out our bathroom gallery page. 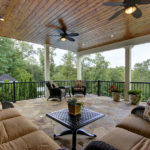 We have been using our construction and design expertise to create dream homes for customers north of Atlanta, Georgia for over 25+ years. You can call us at (404) 483-7446. Or simply fill out the contact form and a Quality Craftsmen Representative will contact you!